Imagine taking a handful of characters from TV’s Mad Men and transporting them to the heart of the African jungle. Consider how out of place they would be. So too the Price family in Barbara Kingsolver’s The Poisonwood Bible. I very nearly didn’t read this book. I didn’t think I’d be able to relate to a family of missionaries who move to the Congo. I wasn’t expecting them to be an all-American 1960s family (tyrannical father aside) with a penchant for Betty Crocker cake mix, pink angora twin sets, sweet sixteen parties and ice-cream cones. To say they are out of their depth in the Congo would be an understatement. What on earth are they doing there? Their situation seems comical at times. If only it wasn’t so tragic. If you enjoy books that make you think, you will love The Poisonwood Bible. Barbara Kingsolver takes the reader on an epic journey to show what can happen when two very different worlds collide. She packs a lot of food for thought into this book. Just when you think you’ve got it all covered, she gives you something new to think about. I could get into a long discussion about The Poisonwood Bible. But you’ll enjoy it more if you discover it for yourself. Thank you Jan for recommending The Poisonwood Bible to me. 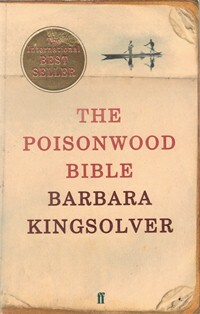 Would you like to read The Poisonwood Bible by Barbara Kingsolver?